In the spring of 2015, Samantha Wise took a job delivering the Register-Guard newspaper. She had a five-mile route that took four hours to walk in the early morning. "I had painful knees from jogging," she says. 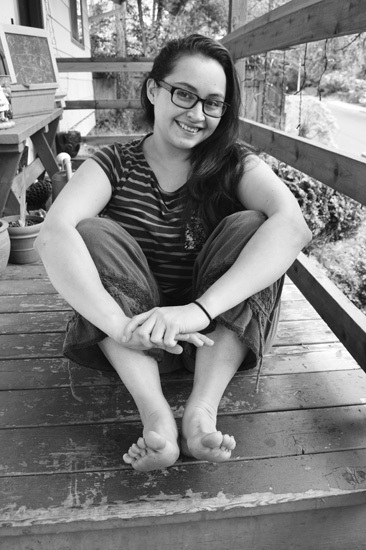 "I learned about barefooting, and I went without shoes around the house and doing errands." Within three weeks of beginning her paper route, Wise had become a 24/7 barefooter, and she no longer had pain in her knees. "It's one of the most enriching things I've done," she says. Wise became a barefooting activist after she was told by a manager at the Market of Choice that she couldn't be in the store without shoes. She joined the online group Barefoot is Legal and returned with a packet a few days later. "If a store is open to the public," she told him, "it shouldn't discriminate on the basis of a dress code." She points out that no shoes, no shirt, no service policies began in the 60s as a way to discriminate against anti-war hippies. An American citizen born in Mexico, Wise moved to White Salmon, Washington, her father's home town, at age three, then to Eugene, where her mother entered the UO, when she was eight. She graduated with honors from Northwest Youth Corps' OutDoor School in 2004. She started having children at age 21 and now has five: Simone, Sylas, Ayasha, Rylee, and Sadie, ages 10 to three. She lives with them and her husband-to-be Phillip, a wildland firefighter, in South Eugene. Her two online stores, Modern Zenobia and DIY Nails Direct, can be found on Facebook.